A new experience happened to me whilst watching Fantastic Beasts: The Crimes of Grindelwald; for the first time I disliked a film that was part of the Potter-Verse. A lover of the books since I was young, owner of every Potter film which is marathoned frequently and an enjoyer of the first Fantastic Beasts film; nothing could prepare me for the disappointment of the sequel. The Crimes of Grindelwald introduces us once again to Newt Scamander (Redmayne) who is off on a mission to find Credence (Miller) who disappeared at the end of the first film. 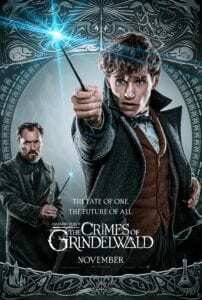 Supported by Albus Dumbledore (a superbly cast Jude Law) and set against the backdrop of the rise of the dark wizard Grindelwald (Depp), Newt comes into contact with new beasts, old friends and dark times. This sequel is the definition of a set-up movie – it is all exposition with little substance. 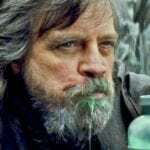 As charming as all the actors in it are, each scene is tied together with exposition filled dialogue and there is no character development whatsoever. We learn a tiny bit more about Newt during this outing but all the characters we loved in the first instalment have nothing to do. Dan Fogler as the no-maj Jacob Kowalski was the standout of the first film, but has been shoehorned in to the script. When we last left him he’d been Obliviated and now he’s back again with Queenie (Sudol) and a vague explanation is given as to why he can remember everything. The issues with canon (and there are a lot) aren’t what makes Crimes of Grindelwald a failure, it is more that nothing the characters do has any consequence and none of them grow throughout the two and a half hour run time. Kowalski is back but he serves no purpose to the plot whatsoever. Similarly Katherine Waterson’s character Tina has nothing to and by the finale Queenie morphs into an unrecognisable character. Crimes of Grindelwald feels like a rushed game of chess where J.K. Rowling has had to hurriedly move her characters into the right positions for the next film, whilst also world building, keeping the canon consistent (which is a big struggle) and attempting to deliver a coherent script and a family friendly blockbuster. It’s no wonder that she’s buckled under the pressure. This film is watchable and in places quite fun, but it feels manipulative and like a cash grab to get the audience to watch the next film. Luckily there is some reprieve of the tawdry exposition with the performances from Jude Law and Johnny Depp. As the young Dumbledore, Law is perfectly cast and exudes the charismatic energy and wisdom that we see more developed in the Harry Potter films. Whenever he’s on screen he is magnetic and livens the film up a lot. Similarly Johnny Depp does his best work in years as the titular villain Grindelwald. In a time dominated by the rise of the right wing, his character is a reminder of how easy it is to sway disgruntled and hopeless individuals. Whilst there are issues with his casting in terms of his personal behaviour, as an actor he delivers a menacing and enthralling performance. As you would expect the look of Crimes of Grindelwald is exquisite. This is director David Yates’ 6th time directing a film in the Potter-verse and he takes his time to relish in Rowling’s world. An opening jail break scene is thrilling to watch and the effects for the various beasts are amazing and help build the world. But no amount of visual flair can sustain such a mediocre script and at times the film is a chore to sit through. A last minute plot twist (which is hopefully a red herring) will have people going back to the cinemas for the third film. We can only hope that the next one will be driven by characters that we care about rather than a serious of exposition dumps.